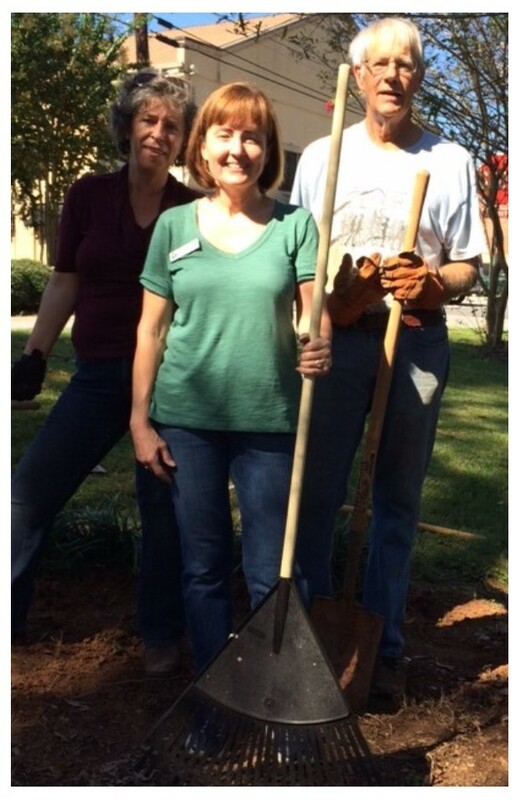 On Friday, October 5, 2018, the Headwaters Masters Gardeners held a Work Day at the Clarkesville Library. The Work Day was scheduled to begin site preparation for a Children’s Garden at the Library on the Jefferson Street side of the building. A small number of volunteers, Wendy Gera, Manager, and Ashawna Green, Youth Serviced Specialist, spent two hours doing initial site cleanup tasks. Master Gardeners participating were Lavon Callahan, Agi Fuetterer and Holly Sparrow. Clayton Sparrow plied the shovel to remove the Liriope for the Master Gardeners and the Library staff. Clearing the garden site of leaves, sticks, and weeds. Clearing a path on the east side of the area overgrown with Liriope. Transplanting some of the Liriope to create a border for a portion of the garden. Light trimming of existing shrubbery. Raking up the oak leaves and putting mulch around some of the existing shrubbery. Another Work Day will probably be planned for early November. After that, the garden will probably be left dormant until planting begins in Spring 2019. If you are interested in donating to the garden effort, please contact either Wendy Gera, Library Manager or Master Gardener Holly Sparrow.